L-R Andre Barretto (facing away), Eric Potter, Malcolm Mooney, Marc Weinstein (seated at drum set), Bill Tutton, at the Echo. Photo by Bob Lee for the LA Beat. For a certain type of music explorer, going through a Can phase is an established rite of passage. The German improvisational collective produced music between 1968 and 1977 that shifted a lot of peoples’ imagination when it came to the true potential of a five-piece rock band. And while they made a lot of great records during those years with different lead singers, the earliest ones, which feature American singer Malcolm Mooney, tend to be the gateway. A visual artist with no experience singing or writing lyrics, Mooney turned out to be a perfect fit in a band made up of guys with serious classical and jazz chops who wanted to play like the Velvet Underground. After two years of near-constant recording, Mooney quit the band and left Germany in 1970, and has only performed a handful of times since. As the Can cult has only grown in the decades following their prime, Mooney’s appearance at the Echo last Sunday, his first LA concert in eighteen years and second or third in history, had the feel of a big-deal event. “I can’t believe this is even HAPPENING!,” one guy behind me blurted out as the set opened with “Little Star Of Bethlehem.” Mooney took a deep breath, consulted the lyric sheet on his music stand, and that familiar, ecstatic flow of sing-song poetry began to drip out of the speakers. The ensuing tale of Froggy, Toady and the tub of water lilies behind the shed became the most important thing in the world for a few minutes. Mooney was back, and was on point. 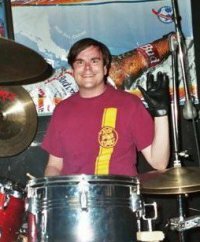 He was backed by an all-LA band with two of everything, including two record store owners in the rhythm section, Amoeba’s Marc Weinstein and Blue Bag’s Chris Guttmacher playing seamless double drums. Bassists Bill Tutton (Geraldine Fibbers, Amadans among others) and Andre Barretto, guitarist Eric Potter and multi-instrumentalist Gregory Griffith created a four-piece string section that was capable of delivering whatever the moment called for. Most of the set list was made up of Can songs from Monster Movie and Delay 1968, and the band managed to play the songs faithfully, capturing certain essential details like the melodica part that anchors “Outside Your Door”, without resorting to imitation of the records. Instead they tried to capture Can’s spontaneous flow, stretching these unstoppable grooves into new forms. They also performed three apparently new numbers, largely improvised, with Mooney in speed-talker mode. These hinted at serious potential for this unit should they decide to record in 2016. Malcolm Mooney’s best-known work may nearing its fiftieth anniversary, but the man himself remains in the moment. After so many years of enjoying his work, it was a pleasure to spend a few of those moments in his presence. 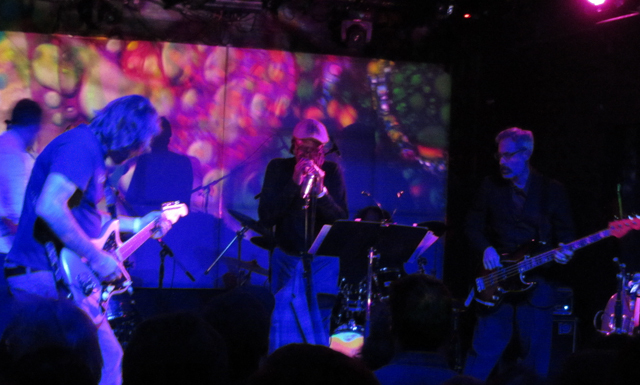 This entry was posted in Miscellanious and tagged can, krautrock, live review, malcolm mooney. Bookmark the permalink. that is actually guitarist Eric Potter pictured on the left. Andre Baretto is behind him playing bass. fantastic show! Duly noted & fixed, thanks, the guitarists were the only guys I didn’t know, and mis-identified them from Facebook posts.